NOAA released their latest global temperature summary this morning, and it shows that November, September through November, and year to date were all the warmest on record in 136 years of continuous record. Some of this is due to the strong El Niño which is warming large parts of the Pacific Ocean, but it also reflects the continuing trend towards warmer temperatures around the world attributed to greenhouse warming. 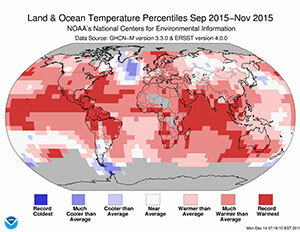 You can read their latest State of the Climate report at http://www.ncdc.noaa.gov/sotc/global/201511. Posted in Climate and Ag in the news, Climate summaries. Bookmark the permalink.